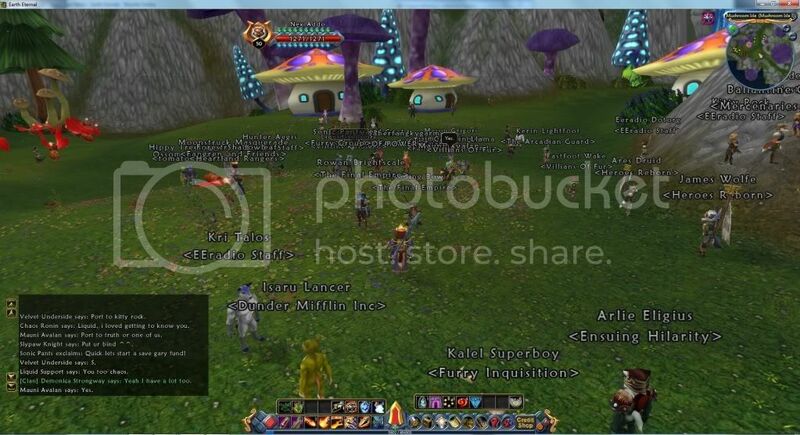 Although at the time we didn't actually know it would be the last big gathering of beasts, KittyBock organized the event and teleported people in for a melancholy and yet nostalgic visit to the defunct but still existing new-player area of mushroom island. For many of us it was the first time back since our inception. For others, it was their first time being there, having been borne too late to see it. There were many more pictures like this on the official forums, but since they are in limbo I decided to post these here. Most conspicuous are By Chilko, Rictar Gaspar, Fara Phoenix, and of course myself. 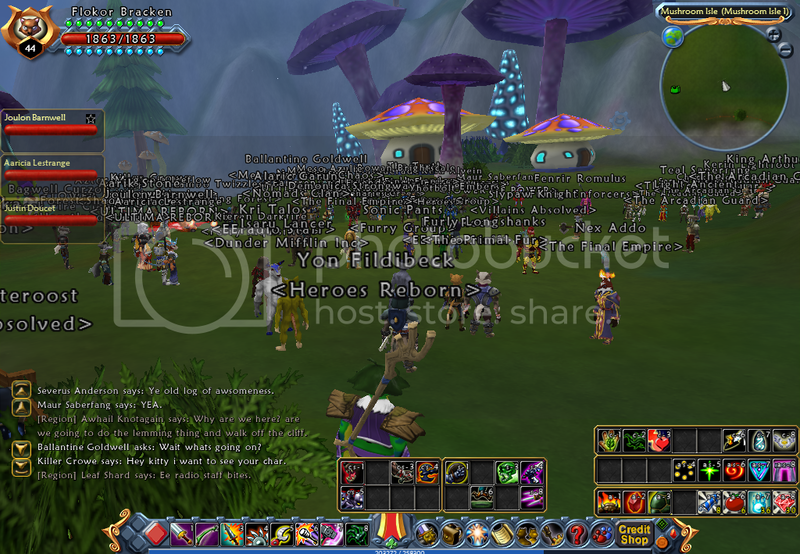 Add your own screenshots if you got them and were at the Mushroom Isle "Wrap" Party. The best of mine for shear amount of people, there's a few more here but mostly got the back of my head in them for fear that moving the camera around too much would anger the Gods of Lag and result in my old comp crashing considering the crowd. How could I miss this? I knew nothing of it untill a few weeks ago! Date/Time? I love big gatherings and feel a bit sad if I miss them. Such great gatherings of the community bring joy to me. That's why I'll never forget the Gathering Of Beasts. Some great screenshots here. I've always loved Rictar's armour and spear. That's why I voted for him in the Gathering Of Beasts' Costume Contest. Can you spot Chuck Noris? No really, he is in this next one, FIND HIM!! It was organized very hastily after the announcement of bankruptcy is why it wasn't disseminated very widely. A shame because it pretty much was the End of the World Party, though at the time we didn't know it - just suspected. I think that's a tradition in MMOs that are ending. In Mythos, everyone stripped off equipment and went on a giant race around the circumference of the overworld. A race wouldn't have been possible on Mushroom Island though. It's pretty small. I missed that event but... the lag would have been such that it would have been unenjoyable. Makes me even happier i found the forum, darn those were the good days. If the first person on the moon was important why wasn't I?